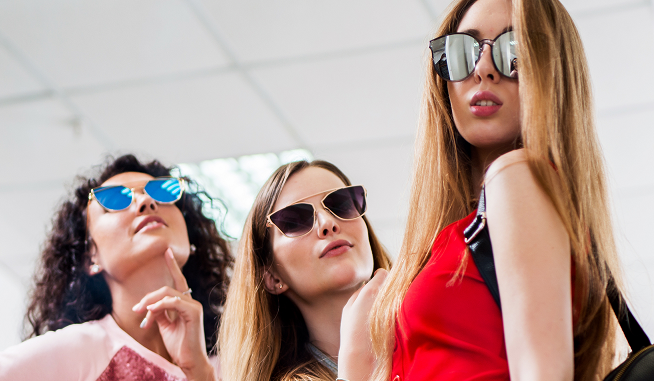 More than just a means to keep your peepers sheltered from the sun’s rays – your sunglasses say a lot about you and are a great way to showcase your personality. Are you a classic, tortoiseshell lady-who-lunches? Then you know these frames flatter every skin tone and work well for all ages. This season designers are taking that classic and giving it a little twist. Looking to get your Classic on? Menswear style glasses are very big this season. Just ask Bachelorette Becca Kufrin, who’s collaboration with DIFF eyewear has created our fav take on the Aviator yet! Coming a close second is Waverly and for those who want their pink and menswear too, the BARRY is a great choice. The 90’s round is also getting a lot of attention lately. And why not? This style goes oh-so-well with athletic gear, ripped jeans and menswear inspired looks. Do your peepers desire a little more real estate? In direct opposition, the super-sized look is still going strong. Oversized frames in all shapes and sizes to ensure as much coverage as possible. Wondering what’s been blowing up on ‘Gram these days? Here are three of the top freshest styles currently having a moment. So many choices, why decide with just one? Sunnies are important eye protection but at the end of the day they’re still a fashion accessory. So have fun with them!